Employee advocacy in Asia: time to let the workers loose? A new study by McKinsey has some revealing findings on the state of reputation management worldwide. Fair pricing is rarely regarded as a top reputation driver by companies but is highly valued by their customers. 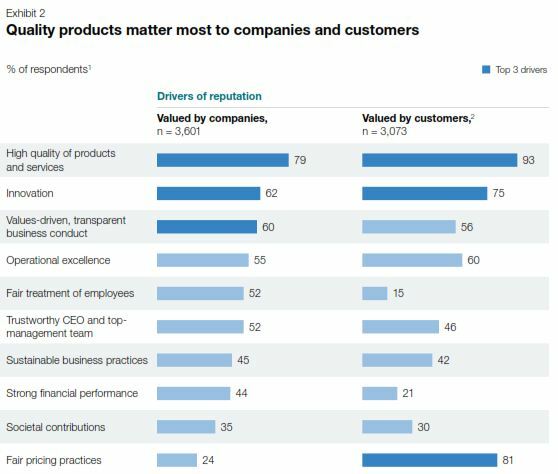 The authors note that the focus on product as the key driver of reputation and value has resulted in a lack of focus on other stakeholders, not least the fair treatment of employees, which only half of the respondents view as a top driver of reputation. The treatment of employees can have a major impact on a company’s reputation, enabling it to be seen as an employer of choice. It can also result in lower recruitment and retention costs and a more productive workforce. Happy and engaged employees can also be great ambassadors for their firm and its products, fueling positive and authentic word of mouth amongst communities, customers and other stakeholders, a benefit that can be enhanced through social media. Having spoken to a large number of international and local firms across Asia in recent months about their approaches to reputation building and management, it is striking that employee communications and engagement has not been focused on or leveraged to anything like the same degree that is the case in more developed markets. In a more command and control business environment dominated by manufacturing, few organisations have considered letting employees other than prescribed marketing or communications professionals loose on Twitter or weibo to extol their firm. This is sensible – positive, authentic advocacy will only stem from fair treatment and substantive engagement. As VMA Group (disclosure: business partner) highlighted in their recent report on Corporate Communications in Asia, companies are increasingly turning their attention to how to retain footloose Gen Y staff, and are hiring specialist employee communications professionals. Those firms which treat their people well, listen to their requirements and ideas and involve them in decision-making, and which trust them to speak objectively and in a professional manner externally, the impact on their reputations can be significantly enhanced.